The dental changes seen in many people with bulimia are often recognisable. Frequent vomiting may cause your salivary glands to swell and the tissues of your mouth and tongue to become dry, red and sore. People with bulimia may have chronic sore throat and small hemorrhages under the skin of the palate. During the treatment of your eating disorder, it may take a while to control the episodes of induced vomiting. To minimise damage done by stomach acid during episodes of vomiting, rinse your mouth with baking soda mixed in water. You also should rinse with a mouthwash containing .05 percent fluoride, which your dentist dental professional can prescribe recommend. Don't brush your teeth immediately after vomiting because stomach acid weakens tooth enamel and brushing can cause erosion of the enamel. When you do brush, use a toothpaste that contains fluoride. Fluoride helps strengthen teeth. To help dry mouth, drink water to keep your mouth moist. There are also saliva replacements your dentist can prescribe. Your dentist dental professional can prescribe recommend daily fluoride treatments with prescription extra-strength rinses, or gels or pastes. You may also find that using a rinse such as Colgate Dry Mouth Relief will help. 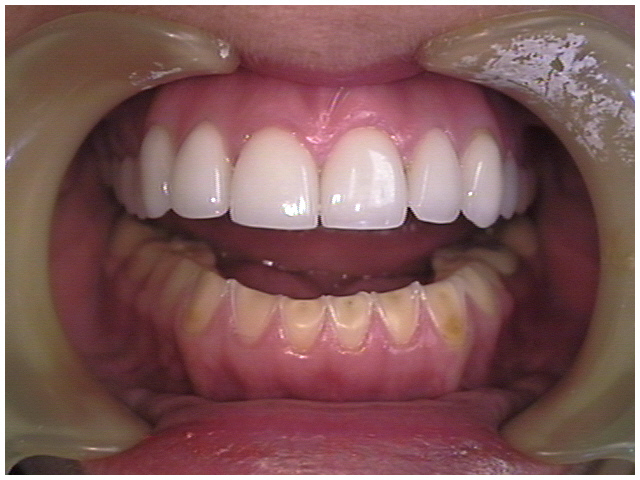 This image shows discoloured, yellow, eroded teeth that can result from eating disorders. If you are bulimic, your dentist dental professional may give you fluoride treatments during your dental visits and may prescribe a fluoride rinse gel for home use. Visit your dentist regularly; he or she can detect decay or infections. It is important to have regular dental checks to make sure that your mouth is healthy. Dental treatment can be an important part of treatment for your bulimia. Your dentist dental professional will work with your health care team and together you can coordinate dental treatment with treatment for the eating disorder. If you have severe tooth damage and are still undergoing treatment for bulimia, your dentist dental professional may be able to give you an appliance that covers your teeth and protects them from stomach acids. Some conditions tend to occur with bulimia. For example, three-fourths quarters of bulimics have serious anxiety disorders, and many experience depression. People with bulimia may also develop alcohol or drug dependencies. These conditions can also affect your dental health and any medications to treat them may affect your dental treatment plan. Make your dentist aware of any medications you are taking, as well as their doses.